...about the public library is the Hold Shelf. I go on line, pick out a few books I want to read, hit the "place a hold" button, and within a few days they show up on the Hold Shelf. Here's my books waiting for me. So, is that one huge book or multiple books wrapped together? And I've never thought about them shortening names that don't fit on the paper- with a 4 letter last name, it's never crossed my mind! 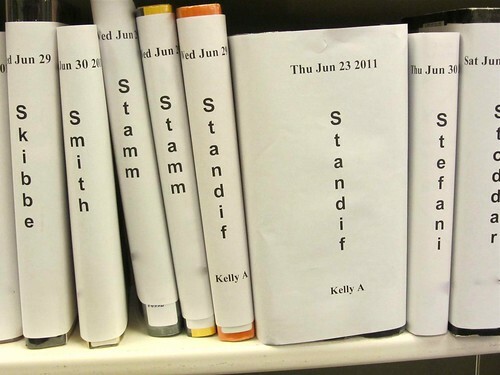 :) It took me a minute to realize that "Standif" was you. I like that the books are covered. It makes the shelves look uncluttered and my friend and I leave messages on the paper for each other. Her last name starts with S too. That is three books not one big one. Sometimes I have to wonder what the librarians think of me. I tend to real a lot of paranormal stuff. Maybe they like it too. We do have some interesting librarians. Notice I tried to preserve other patrons' privacy by not showing their first names.